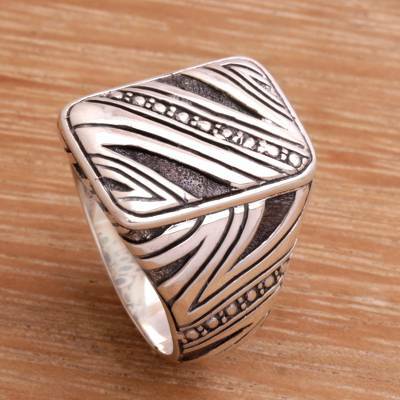 Men's Handcrafted Sterling Silver Ring from Indonesia, "Energy Path"
You can find men's sterling silver ring 'Energy Path' by Putu Gede Darmawan in jewelry categories such as Modern Rings, No Stone Rings, Silver Rings, Sterling Silver Rings and Signet Rings. Enjoy exploring these sections for other Novica treasures. Ring design is excellent overall, and the artisit has made a great name for himself by presenting pieces like this for us. This is the third item I've purchased from this artist. The quality is amazing, this Energy ring is even better looking in person than in the picture. You won't be disappointed. I have looked for the perfect ring for a man that really doesn't wear rings. The design and the name 'Energy' were perfect.